Every paparazzo's dream was fulfilled Sunday night when Paris Hilton, Britney Spears, and Lindsay Lohan jumped into a car together while leaving a party. According to Paris Hilton's rep, just before they drove off to Hilton's house, the trio mended their rift in a girls-only discussion. The latest drama between the Hilton and Lohan started more than a week ago when Lohan was videotaped leaving the Roosevelt Hotel and reportedly called Hilton a four-letter word. Hilton and Spears have been inseparable the past few weeks. This past Saturday night, Hilton's rep Elliot Mintz says Britney and Paris went to an after hours party and that trouble ensued when Lohan arrived. "Lindsay showed up and there were some unpleasant words exchanged," Mintz told The ShowBuzz on Monday. "I think that the derivation of that had to do with the fact that a week or so ago, Lindsay was videotaped as using a very, very unkind reference to Paris, and I believe it was the first time Paris had seen her since that utterance and that probably created the friction." Sunday the Web site X17 posted a video of Lohan in which she says the heiress hit her and threw a drink on her and that it's "not OK." She showed what she said was a bruise on her arm. Mintz says that last night after a stop at a club for live jazz, he accompanied Spears and Hilton to another late night party where Lohan later appeared. "When Lindsay arrived, the three women, Britney, Paris and Lindsay, went into a private room and talked out their differences, in a very civil way," he says. "I did not hear loud exchanges or anything of the kind when they came out of the room — and we left the party at 3 or 4 o'clock this morning … (Lindsay) got into the car too, with Britney and Paris, and the three of them went to Paris' house. I was with the three of them at Paris' house, they were all getting along just fine and I hope that the weekend drama is past them, and that only bright skies lay ahead." In a video filmed early this morning as the trio hopped into Hilton's car, Lohan told photographers that Hilton did not hit her and that "we're all friends." 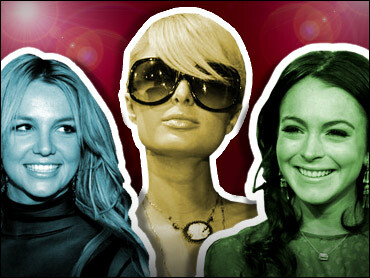 Lohan's rep confirmed that the ladies ironed out their differences.